Aug. 23 You can fly or drive from any US or Canadian city to SEATTLE, Washington. Boarding begins at noon. 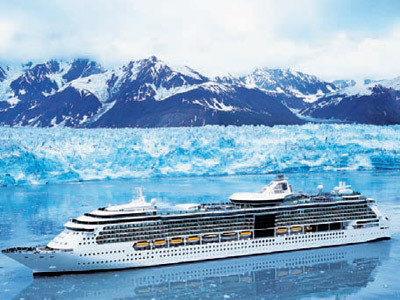 At 4:00 p.m., your ship begins its journey for views of glaciers, mountains, waterfalls, and wildlife. Tonight, separate dining room tables are reserved for our group of Jehovah’s Witnesses, so you can get acquainted with other Friends from various parts of the country. Aug. 24 Today is a “Fun Day at Sea” with a variety of activities on the ship. See how nature has outdone itself as you cruise the Inside Passage noted for humpback whales, porpoises, eagles, black bears, and sea lions. Tonight, is a dress-up or more formal evening followed by a Broadway musical show. Aug. 25 Arrive in the mountain city of JUNEAU, the capital of Alaska known for its historic downtown surrounded by water, steep mountainsides, and glaciers. The only way to Juneau is by water or air, as there are no roads, which means all vehicles must arrive by boat. 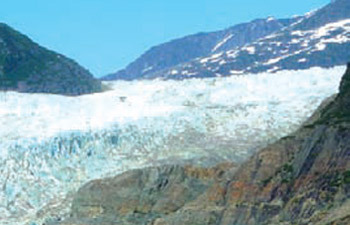 This is where the famous “Mendenhall Glacier” is located that’s a mile wide and six miles long. You can walk up to the glacier or take a helicopter ride where you will land to actually walk on top of the glacier. You can even go dogsledding. Aug. 26 Entire day is in charming SKAGWAY, Alaska, an old gold rush town where the streets will take you back over 100 years. Today, wooden sidewalks, old-fashioned saloons and gift shops are reminders of the Alaskan Gold Rush days. 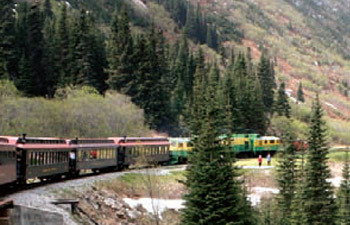 You can take a train ride to the Yukon on one of the most scenic railway rides in the world to the top of the mountain where you will see a variety of wildlife and rushing waterfalls. Aug. 27 This morning you’ll experience a spectacular sight as you drift through the 30-mile journey to the Endicott Arm Fjord with front-row views of Dawes Glacier. You’ll see waterfalls and massive glaciers that are more than you even imagined. Huge ice chunks, as big as a city block and as tall as a three-story building, often fall into the sea. This is called calving and is why this thrilling cruise itinerary is rated #1 in Alaska! Aug. 28 A “Fun Day at Sea” to enjoy all of the fun activities including a live Broadway performance in the showroom. Tonight, is another dress up evening, as the chefs have prepared a surprise dinner with singing waiters. Aug. 29 Today, you will dock in the beautiful city of VICTORIA, BRITISH COLUMBIA in Canada. Here you can visit Craigdarroch Castle and Chinatown or have afternoon tea at the world-famous Empress Hotel. Entire day is free to walk around the city and its beautiful waterfront. 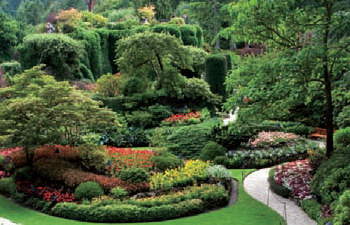 Be sure to visit the colorful Butchart Gardens. At 6:00 p.m., your ship departs to Seattle. Aug. 30 Arrive SEATTLE, Washington and transfer to the airport for your return flight home. You have now seen some awesome nature at its best! CRUISE ONLY INCLUDES: All on board meals and entertainment. All inside cabins have a virtual balcony which is a high-definition screen with a built-in camera providing actual moving views of the ocean and surrounding areas. You may also choose a balcony cabin which has a private patio overlooking the scenery, where you can sit outside and enjoy a morning coffee or a beautiful sunset while watching for wildlife. Round-trip transportation to the cruise ship is $55 per person or you can make your own arrangements to and from the ship.